This is part of my set of notes from the Startup School 2006 sessions at Stanford. 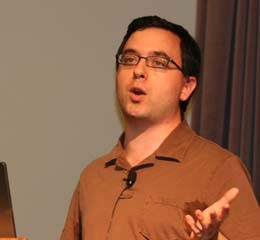 Joshua Schachter is the creator of del.icio.us, the popular social bookmarking system now owned by Yahoo. In this session, Joshua shared his advice for entrepreneurs looking to start a company. Built muxway, which was a lot like del.icio.us but for a single user. Allowed user to organize bookmarks by tags. Interestingly, left the site open so others could see his bookmarks. Ended up realizing he had 10K daily readers just of stuff that he thought was interesting. Make sure it’s a problem that you have that you’re solving. You can’t be the smartest person out there, but you can be the most passionate. Implementation of your ideas: what ideas are interesting that are low-cost to implement so you can move quickly from idea to implementation. Before del.icio.us, he tried to do about an idea a year besides the day job. You need to get in the habit of having lots of ideas, implementing them, and getting better at that whole process. Get the stuff out there, a prototype. Hiding it behind a “we’ll tell you when we’re launched” only worked the first 80 times. You get far more value talking about stuff. Everything you do is marketing – every feature is something you can talk about, your competitors can talk about, that helps you. Generating this enormous project alone in secret hurts you. Who are you going to infect next? Interesting note: all his competitors have an import from Del.icio.us, but none of them have export functionality like Del.icio.us. Del.icio.us was explained as “social bookmarks” – most people didn’t know what bookmarks were, as it was a Netscape term. Most people knew about Favorites, because that’s what IE calls them. Go to Starbucks, offer someone coffee to sit down and play with your product. Don’t give them tasks, as they will behave incredibly differently than they will sitting at home in their underwear. Throw out everything you don’t need – serves you because you understand the problem better, implement it better, because there’s less to have to understand or implement. Make URLs readable, albeit to technical users; it’s prime real estate, so why is it full of .php and session IDs? You don’t know how users will use it, and you’ll end up spending a lot of time on it only to have to do it again later. A lot of systems do not grow up appropriately. For example, forums work for 50 users, but not 10,000 users. If you’re building a social or online system, abuse and spam will happen. If you’ve got something worth using, abuse is inevitable. Build in some logging to allow you to observe aggregate behavior. Del.icio.us had a guy who would post an item, delete it a minute later, and then re-post it so he was always on the front page. People that put 475 tags on a post are abnormal. Expect to spend about 300x what you budget for this type of stuff. MySQL will fail. RAID array will crash and burn. CSS will not render properly in Opera. Get good or find someone that is good at them. But when you’re getting started, skip’em and focus on what matters. Don’t be involved in low value transactions. Be focused on what’s a good use of your time. Figure out someone who’s better with dealing with VCs, organizing your schedule, etc. What were your goals for del.icio.us when you were doing it? Was only really doing it for myself, never really trying to build a company despite having people offer to buy it away from him. Enterprise versus consumer apps – what direction should an entrepreneur take? Enterprise apps – if you can point to a specific guy in the organization who’s life will be made easier by your app, you’ve got something. Conversely, look at wikis – for whom does this solve a problem. It’s valuable, but there’s no one who’s specific life would be made easier by a wiki. What was the turning point when you decided to quit and work on it full time? I was lucky because my group blew up, so my choices were to either go find another job or pursue del.icio.us. What was your funding model or business model? They had actually 15 different ways to make money off of it, but given the growth of the user base it seemed to stop mattering as advertising was the obvious route. Do you think it’s bad advice to start a company on your own? His situation is not representative – walking into a room with large number of users, steady growth made it very simple to defend a company that was a single person. At the heart of Cogenz, there’s a Microsoft core. With some corporations this is often a plus. With most of the Web 2.0 aficionados, it’s usually Ruby on Rails and LAMP that come first.